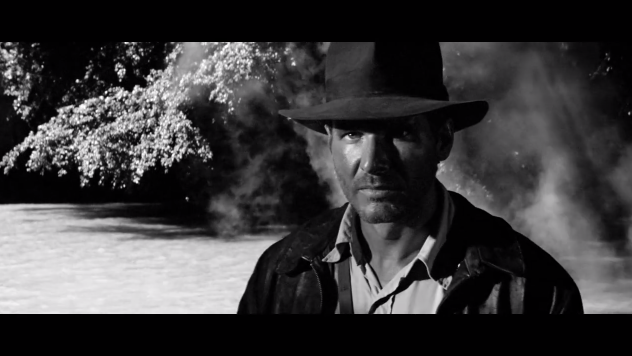 Steven Soderbergh Creates Silent, Black & White Recut of Raiders of the Lost Ark to Explain the Art of "Staging" | Open Culture Steven Soderbergh Creates Silent, Black & White Recut of Raiders of the Lost Ark to Explain the Art of "Staging"
Since officially retiring from filmmaking last year, Steven Soderbergh has filled his time writing Twitter novellas, creating mashups of Alfred Hitchcock and Gus Van Sant Psycho films, and posting a log of all the films, TV shows and books he immersed himself in in 2009. Now comes his latest side project: On his web site, extension765.com, Soderbergh presents a short lesson in "staging," a term that refers in cinema "to how all the various elements of a given scene or piece are aligned, arranged, and coordinated." He tells us: "I operate under the theory a movie should work with the sound off, and under that theory, staging becomes paramount." … and … it’s gone.